The Baltoro Glacier, at 62 kilometers long, is one of the longest glaciers outside of the polar regions. It is in Baltistan, in the Northern Areas of Pakistan, and runs through part of the Karakoram mountain range. The Baltoro Muztagh is to the north and east of the glacier, while the Masherbrum Mountains lie to the south. At 8,611 m (28,251 ft), K2 is the highest mountain in the region, and three others within 20 km top 8,000 m.
The glacier gives rise to the Shigar River, which is a tributary of the Indus River. 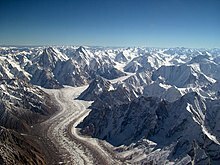 Several large tributary glaciers feed the main Baltoro glacier, including the Godwin Austen Glacier, flowing south from K2; the Abruzzi and the various Gasherbrum Glaciers, flowing from the Gasherbrum group of peaks; the Vigne Glacier, flowing from Chogolisa, and the Yermandendu Glacier, flowing from Masherbrum. The confluence of the main Baltoro Glacier with the Godwin Austen Glacier is known as Concordia; this location and K2 base camp are popular trekking destinations. The trough of this glacier is very wide. Small valley glaciers form icefalls where they meet the trunk glacier. The sidewalls vary from very steep to precipitous. The glacier has carved striations on the surrounding country rocks. Moving ice has formed depressions, which serve as basins for numerous glacial lakes. The glacier can be approached via the important Balti town of Skardu. This page was last changed on 21 July 2014, at 16:04.